Blend OREO Cookies into homemade white chocolate fudge to get a sweet Cookies and Cream Fudge that your whole family will love. This simple 3-ingredient fudge can be made in minutes in the microwave. If dipping an OREO Cookie into a glass of cold milk makes you happy, then this cookies and cream fudge is for you. It combines vanilla cream filled chocolate cookies with silky smooth white chocolate fudge. The combination of chocolate and vanilla is a classic that’s hard to beat. They are just a perfect pair. This homemade fudge is so simple to create, just grab a package of Oreos, some white chocolate chips, and sweetened condensed milk and let’s get started. 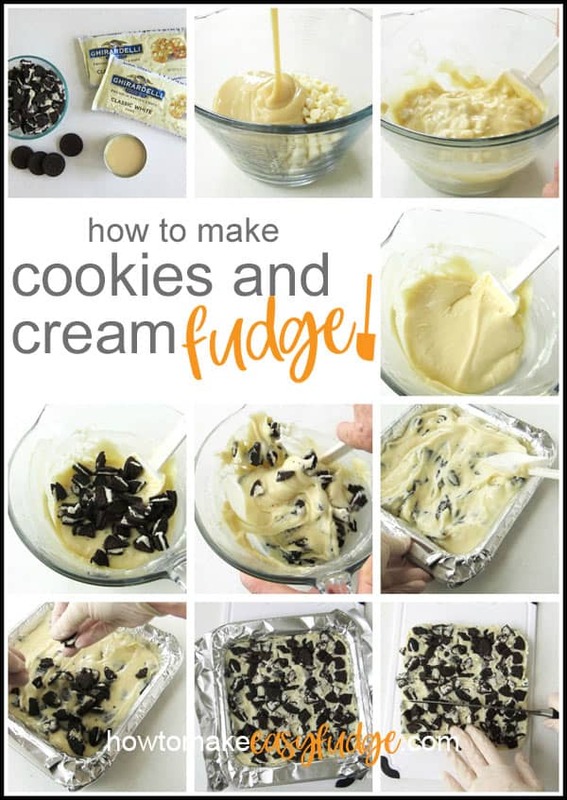 To make this cookies & cream fudge you simply melt white chocolate with sweetened condensed milk then blend in some cookie pieces, spread it into an 8 inch square pan, then add more cookie pieces on top. You’ll be done in under 10 minutes. 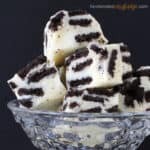 Before you get to the recipe let me answer some questions you might have about this OREO Cookie Fudge. 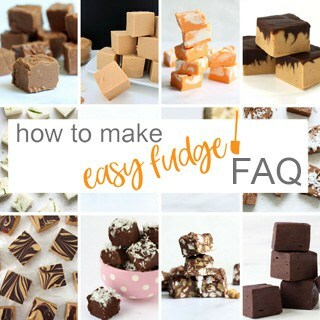 You can find even more answers to the most frequently asked questions on our How To Make Easy Fudge FAQ page. What type of white chocolate should I use to make Cookies and Cream Fudge? Basically you want to use a white chocolate product that you enjoy eating straight out of the package. You can use any of the items listed below. 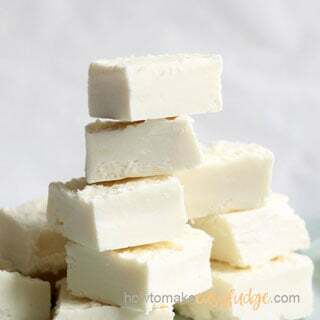 I personally used Nestle Premier White Morsels for this easy fudge recipe and the texture and flavor were wonderful. These white “chocolate” chips are made using a vegetable oil (palm kernel oil) instead of cocoa butter but have a lovely vanilla flavor that works really well in this fudge recipe. You may also use a pure white chocolate that contains cocoa butter in the ingredients. Both will work fine for this recipe. White chocolate bars are made with cocoa butter which will give your fudge a creamy off-white color. Finely chop the chocolate or grate it using a cheese grater so that it melts easily. All of these items are similar to white chocolate but are made using vegetable oil instead of cocoa butter. 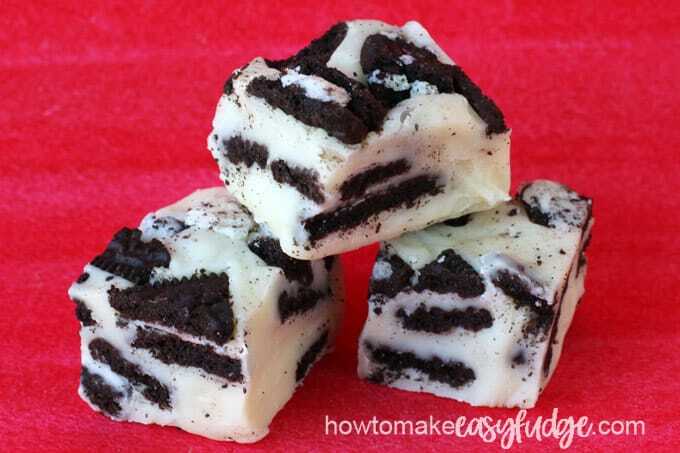 If you like the flavor of the candy then it will taste great when turned into this OREO Fudge. 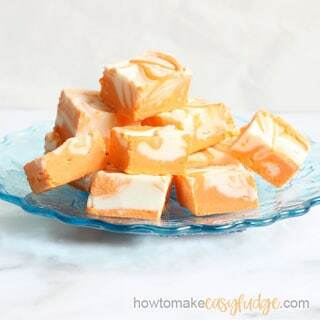 If you don’t enjoy eating the candy straight out of the package do not use it for this easy fudge recipe. If using white confectionery coating chips (no cocoa butter listed in the ingredients) use 16 ounces, if using pure white chocolate (with cocoa butter listed in the ingredients) then use 18 ounces. Do I have to use OREO Cookies in my Cookies ‘n Cream Fudge? Nope! Any chocolate cookie will do, but OREO Cookies are so yummy! They do make a great tasting cookie fudge. Did you know you can use OREO Cookies to make adorable treats like Mini and Mickey Mouse Oreos, Easy OREO Crabs, Pac Man Oreos, and OREO Frogs? These are just a few other great uses for OREO Cookies. 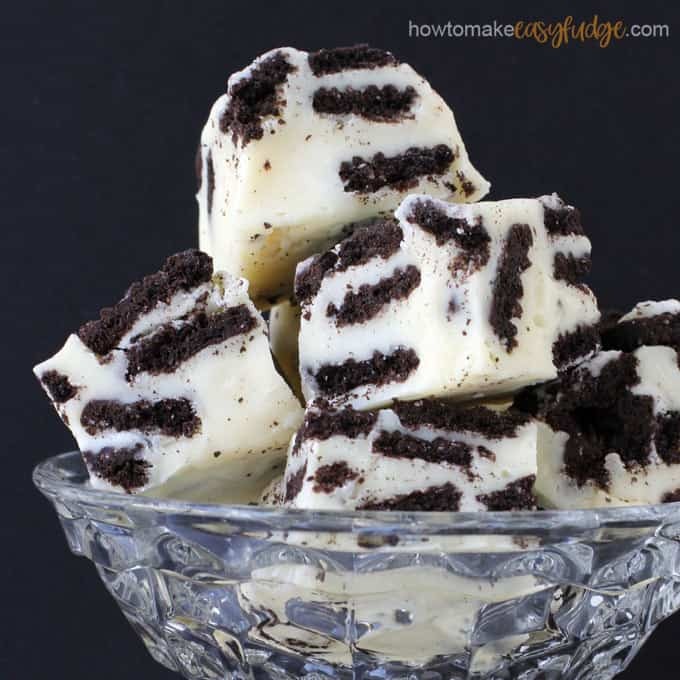 Do I have to make this easy cookies & cream fudge recipe in the microwave? No, you can melt the white chocolate chips and sweetened condensed milk in a saucepan on the stove set over low heat. It’s always best to melt chocolate slowly over low heat. Allow the candy to heat until about 75% of the chocolate has melted, then remove it from the heat, let it rest a few minutes, then stir until smooth. This will keep your fudge from getting greasy. If you over-heat the fudge the oils or cocoa butter can seep out of the white chocolate. Don’t worry you can fix it. What should I do if my fudge becomes greasy? Pour the fudge into a clean bowl and allow it to sit and cool for about 15 minutes. Then stir the fudge slowly in order to incorporate the oil back into the fudge. If it’s still greasy, let it sit a bit longer and repeat. It’s important that most of the oil is incorporated back into the fudge or the fudge might become a bit dry. To speed up this process you can pour the fudge out onto a marble cutting board, a granite counter top or a metal non-stick cookie sheet and swirl it around, scraping it up and kneading it into itself, until it becomes cool and thickened. The fudge will become quite thick so you may have to press the cookie pieces into it then press the fudge down into your pan. 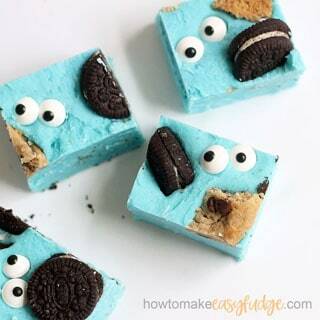 If you love the flavor or cookies and cream but want a fudge that’s a bit more fun be sure to check out our recipe for Cookie Monster Fudge. It’s so cute! You can find the items needed to make this fudge on amazon (commission earned for sales). If you love Cookies and Cream you will love this fudge! It has the perfect proportion of sweet creamy fudge to crunchy Oreo cookies. Pour the white chocolate chips or white confectionery coating wafers and sweetend condensed milk into a microwave safe mixing bowl. Let the bowl rest in the warm microwave for about 3 minutes. If white chips are not all melted, repeat the process above, only heating for 15 seconds at 70% power. Reserve about a third of the cookie pieces to sprinkle over the top of the fudge, then stir the rest into the fudge. Pour the fudge into the lined baking pan then sprinkle the reserved cookie pieces over top of the fudge. Chill in refrigerator for 3 hours or until firm. 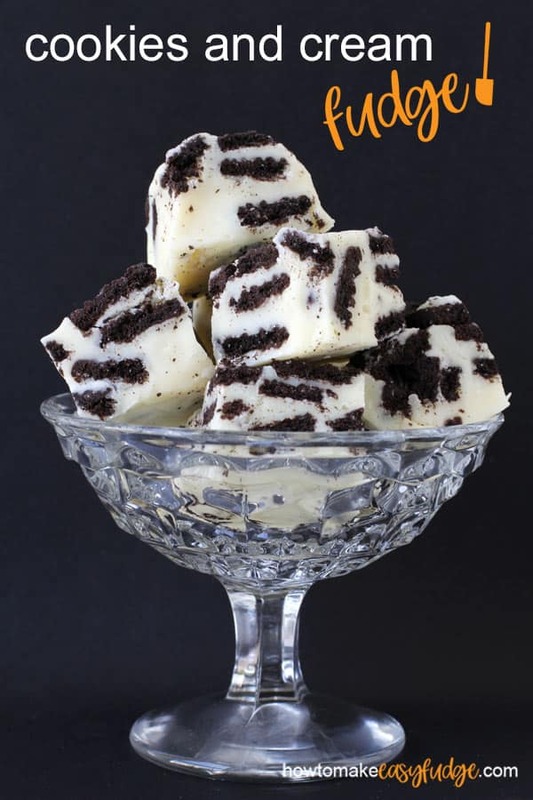 Enjoy making and eating this wonderful Cookies and Cream Fudge. 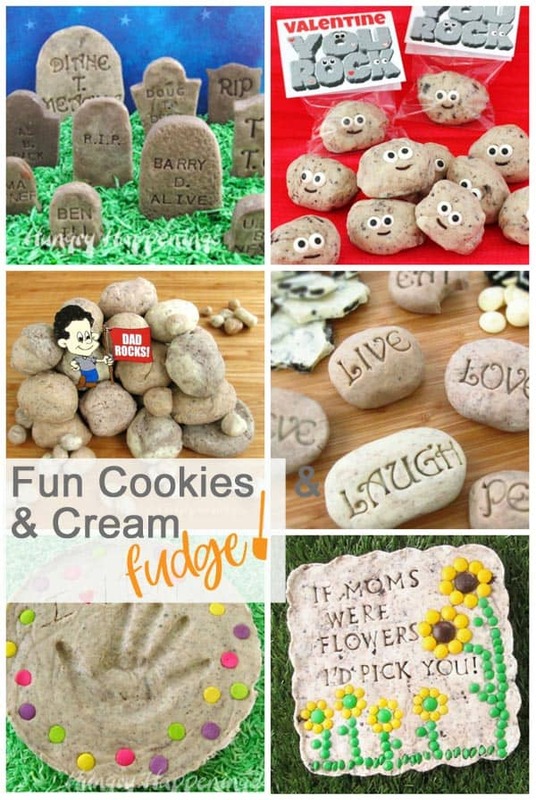 Did you know you can use this fudge to make fudge rocks, edible garden stones, and even candy tombstones? Head over to HungryHappenings.com to see all these fun treats made using Homemade Cookies ‘n Cream Fudge. Can’t wait to try this easy fudge recipe. I have a few people in my family who absolutely love Cookies and Cream. I know they will enjoy this. I know your family will love this fudge if they already enjoy the flavor of cookies and cream. I love that you gave suggestions of what other cookies could be added! Great recipe, thanks! I’m glad you found that to be helpful. I am excited to make Biscoff fudge. I am in love with those cookies and think they will make a wonderful fudge. Love this! My kids love all things Oreo so I’ll have to try making this with them someday. I hope they enjoy their fudge! My mom is such a huge fan of cookies and cream ice cream that I just had to make this for her for her birthday. She loved it. It was so easy to make that I loved it too. I’ll definitely be making this again. I’m so happy that your mom loved this cookies and cream fudge! This fudge was so easy to make. The cookies definitely get soft so we just ate it quickly, which was no problem in our house. Yummo!!! This is so delicious. Thanks for the easy recipe. My family loved this fudge. It was so easy to make. We ate the entire pan over the weekend. We couldn’t help ourselves. I’m so happy to hear you really enjoyed this fudge!